Hi Everyone, I hope you are all having a great week and that you have an even better weekend. I don’t usually do this but I would love if you could take a couple of minutes and Nominate Homemade Delish for the Saveur’s Award. 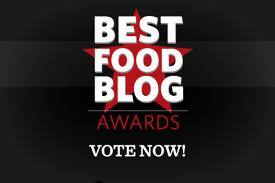 Here is the link http://www.saveur.com/food-blog-awards/index.jsp Thanks Again for all the support and love. All done. Hope you win! Left a comment earlier but it didn’t go through. Oh well maybe this one will. I nominated you. Hope you win!